Back in late June of last year I adapted the comparative with silver from the Nasdaq top in 2000, to the prequel asset bubble of the late 1980's - the Japanese Nikkei market (explained Here). 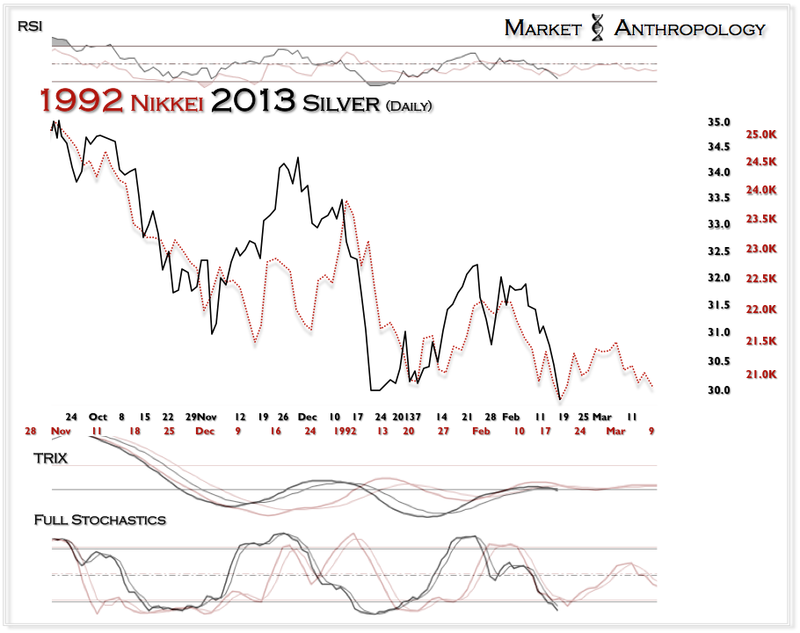 And although the Fed subsequently intervened with additional quantitative measures in September and once again in December, silver has continued to follow the momentum drain and profile of the Nikkei market - some seven months later. 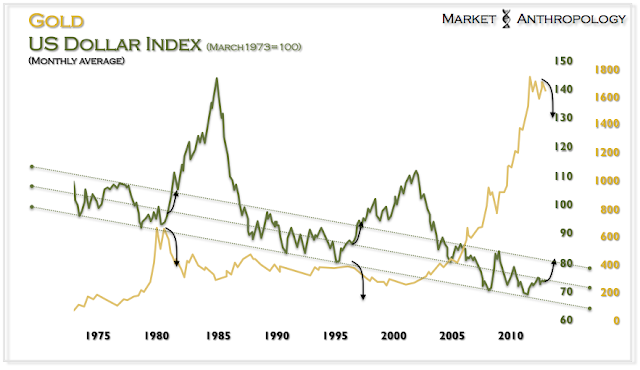 It has been my standing belief that when the US dollar bottomed in 2011, and despite the historic quantitative measures undertaken by the Fed - the precious metals, and peripherally the commodity markets - were now large asset bubbles on the backside of the cycle. 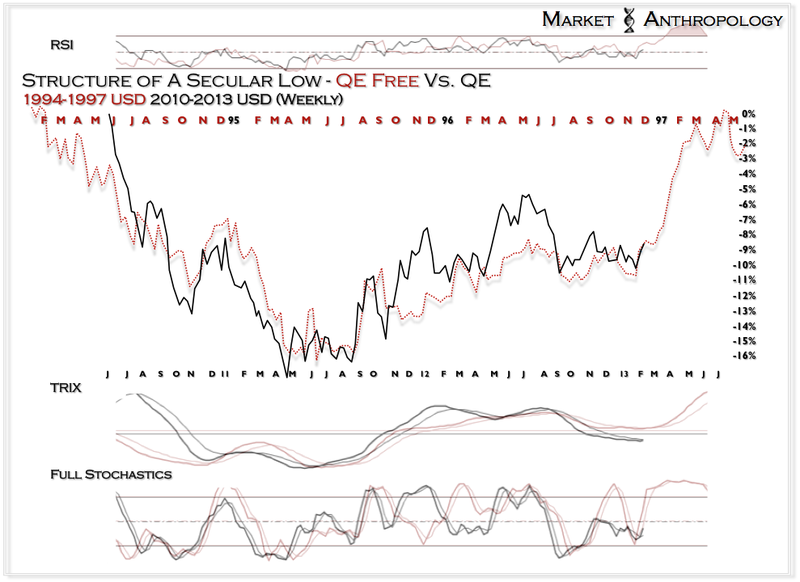 It is why I have referred to the US dollar low comparative as "QE Free Vs. QE", because I wanted to make the not so subtle point that regardless of the Fed's hand, the US dollar was still carving out a secular low - very much along the lines of its last. Backing away from the more efficient market construct with the belief it is an imperfect calculus as to why any asset - let alone a currency, settles at an arbitrary price; I would argue the weight of causation tends to favor perception and the underlying market psychology of said asset - rather than the structural underpinnings themselves. 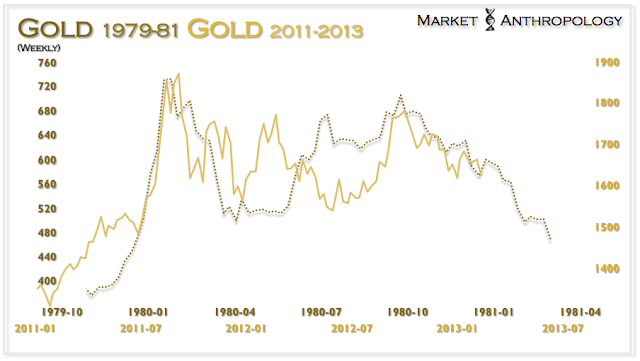 I would argue this neatly explains the US dollar as the primary motivator of gold and silver and the historic commodity cycle over the past decade. They became - for all intents and purposes, massively overvalued currency hedges of the US dollar. Undoubtedly, there have been various supporting, propelling and governing measures for each respective asset along the way, but the US dollar - the world's dominant reserve currency - was the catalyst for concern with setting those fires ablaze in 2002, and the catalyst that is now extinguishing them as it pivots out of an intermediate-term low and away from another secular low. Hysterical capitalists don't fret, there's plenty to be concerned with that will surely light the next asset fire in the capital markets. However, the end of US dollar hegemony does not appear to be one of them right now.